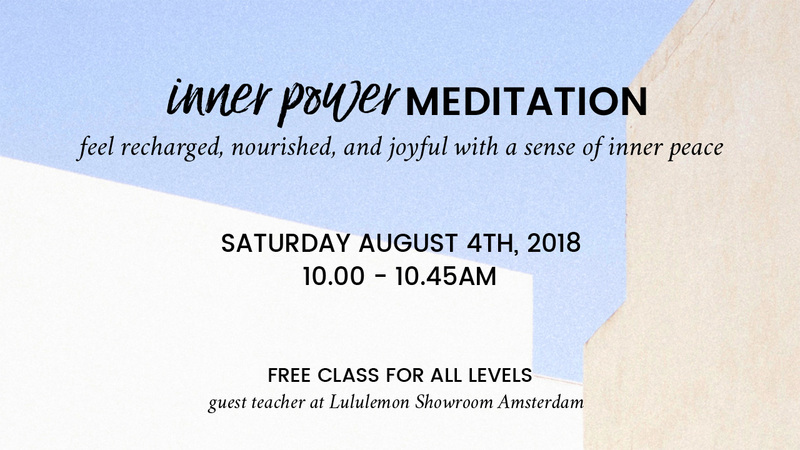 I’m honored to be a guest teacher at Lululemon’s “Saturday Meditation” event! Every Saturday of the month they host a complimentary meditation class for the community. On Saturday August 4th, 2018, I will be leading the class. Since it will be the Pride Canal Parade on Saturday, I created an “Inner Power Meditation” flow class that will leave you recharged, nourished, and joyful with a sense of inner peace. So please join me for a boost of fresh energy before hitting the streets! During this “Inner Power Meditation” flow class we will start with 15 min of grounding, 15 min of activating your radiant inner power with a guided meditation, and 15 min of silence to let this new energy flow into your entire being. After the class I will have a small gift for you, so you can continue your daily practice with a 3 min morning ritual and stay connected to your inner power! This class will be in English and is for all levels. Investment: Free! The mats and props will also be provided free of charge.